I was first introduced to meditation while trekking in Nepal at age 21. My best adventure buddy and I spent six weeks trekking the Langtang and Annapurna regions of the Himalayas. In the full, blissful ignorance of being 21, we were without a guide, navigating the Himalayas at 17,000 feet on our own… well, and with a seven-year-old Lonely Planet guidebook. While trekking, we met a fellow traveler who had just returned from a silent retreat at a Buddhist monastery. Our fellow traveler was silent no more and made up for lost time as she excitedly reviewed the details of her recent experience! Amidst my own suffering with a nasty stomach bug that seemed to hit me the moment the plane touched down in Katmandu, along with a heavy pack and hiking boots that were a size too small, many of the details of our friend’s story are lost. What I do remember is her talking about paying attention to each of her steps while hiking. The monks that she spent time with had taught her to attune to where each foot was placed, how it felt to place it there and to only focus on that one foot before taking another step. As she shared this simple practice with us, she had us align our breath with each step and return to our breath anytime our mind began to wander to anything other than the step being taken in that moment. This gift of mindfulness remained with me through the duration of trek, as the physical and emotional terrain became more challenging. The Himalaya and all of her glory showed me no mercy while unearthing and presenting me with many of the less than pleasant truths of my life. A few months later I returned home to Colorado and began to face some of the realizations revealed on the trail. Traumatic grief experiences from adolescence had left a dark residue on my spiritual and emotional self that I hadn’t been able to shake off with talk therapy alone. I continued to experience deep suffering from my past at energetic and spiritual levels that made me feel unable to completely move forward from the pain. Several years later while working as a secondary teacher in an outdoor educational setting, I met a fellow teacher and shaman who taught me how to meditate. She practiced an eclectic approach of mindfulness meditation integrated with Eastern and Shamanic traditions. I engaged in weekly study with her as I developed my own meditation practice. For the first time, I began to feel free from past suffering by learning to be in the present moment. After six years of teaching, I moved to Chicago to attend graduate school for social work. My clinical internship was at an inpatient hospice unit. Through connecting with individuals in the dying process and their loved ones, I began to observe the interconnectedness of meaning, spirituality, and suffering. These elements have long been acknowledged as crucial aspects of the dying process from the earliest wisdom traditions to present day hospice professionals (Singh, 1998). The spiritual transformation of dying people has been most observed by caretakers through the phenomenon of Nearing Death Awareness (Callanan & Kelley, 1992; Singh, 1998). Hospice nurses Maggie Callanan and Patricia Kelley (1992) describe Nearing Death Awareness as, “A special knowledge about—and sometimes control over—the process of dying” (p. 13). Insights about dying and what patients need for a peaceful death are major characteristics of Nearing Death Awareness (Callanan & Kelley, 1992). However, communications of the dying are often overlooked or misunderstood by caregivers because the messages of the dying are frequently conveyed in symbolic language as they move further into transpersonal realms (Callanan & Kelley, 1992; Singh, 1998). The clinician’s ability to support the person who is dying and their family in making meaning of their life is critical for how the individual and their family approach and experience end of life care. During my time in the hospice setting, I began to explore the concept of teaching caregivers the technique of meditation as a tool for attuning to the spiritual transformation and communication with the individual in the dying process. This work led me to Ananda’s Expanding Light meditation teacher program in 2012. The two weeks I spent at Ananda were filled with positive transformation and connection with self and fellow participants. I will always consider this time and the people I met there sacred. To me, Ananda is a place of peace, joy, and a time to connect with one’s highest self. I was particularly drawn to the work of Ananda resident and teacher, Dr. Peter Van Houten. Dr. Van Houten introduced me to the neuroscience of meditation. I was awestruck by the developments in neuroscience that demonstrated how meditation literally changes the human brain. As I delved more deeply into this study, I was simultaneously learning about how trauma impacts the human brain. I was delighted to realize, as many have, that the very areas of the brain negatively impacted by trauma, were positively impacted by meditation! Neuroscientists and authors of, How God Changes Your Brain, Andrew Newberg and Mark Waldman (2010) found that meditation positively impacts the limbic system parietal lobe and prefrontal lobes. The limbic system is a primitive area of our brain associated with our survival instincts and emotions such as fear, anger, rage, and aggression. When we experience being upset, frightened, or anxious, the cells in our limbic system began to “fire.” An overactive limbic system results in a state of psychological turmoil. This phenomenon can be observed in survivors of trauma who may have an overactive limbic system as a result of the trauma they have experienced. Newberg and Waldman’s study indicated that after 12 weeks of meditation for 20 minutes a day, the activity of the amygdala (area within the limbic system that produces fear & anxiety) was significantly reduced (2010). Newberg and Waldman’s brain scans of people who practice contemplative forms of Christianity and Buddhism showed decreased activity in their Parietal Lobe while meditating. An active Parietal Lobe pertains to our sense of self and relationship with time and things outside of us (2010). The decrease in activity is believed to explain the sense of timelessness, expansiveness, and one-ness often described by regular meditators. When not meditating, the brain scans of regular meditators showed increased activity in the Parietal Lobe (2010). This indicates heightened levels of awareness and an ability to attune to other people’s thoughts and emotional states. Our Prefrontal Lobe is the most advanced region of the human brain, closely correlated with one’s levels of joy and life satisfaction (Van Houten, 2010). This region of the brain is associated with our most positive attributes: “idealism, joy, our ability to concentrate, creativity, stress management, increased emotional self-control, social awareness, compassion for others, and our ability to think abstractly” (Van Houten, 2010). Brain scans of long time meditators indicated highly developed prefrontal lobes. Newberg and Walden attribute this to the fact that when a person meditates, they are concentrating on the point between the brows (prefrontal lobes region) often referred to by Yogis as the “spiritual eye.” The focus on the prefrontal lobes increases activity there, while decreasing activity in the limbic system. Newberg and Walden also found that meditation increased activity in the anterior cingulate, which is directly related to a person’s ability to feel compassion for others. With this knowledge, I began a two-year fellowship within a pediatric emergency and inpatient medical setting. During this time I worked with children, adolescents and their adult caregivers who had experienced complex trauma, sexual abuse, sexual assault, community violence, trafficking and numerous forms of child maltreatment. I witnessed first hand how these various traumas impacted the individual, their family and community. I also observed how caring for survivors of trauma impacted the helping professionals providing care to these individuals. In Trauma Stewardship, Lauren van Dernoot Lipsky discusses the nature of traumatic exposure and the helping professional. Anyone who is doing work with an intention to make the world more sustainable and hopeful is exposed to the hardship, pain, crisis, trauma, or suffering of other living beings or the planet itself. Constant exposure to suffering changes how they experience the world. As I navigated my own traumatic exposure response, I began offering trainings to nurses on the practice of self-care through the use of meditation. I was initially nervous that this information would not be taken seriously. The opposite occurred. Everyone wanted more information and more practice with the technique of meditation. Four years later, my role with the hospital has changed from trauma, violent injuries, and child maltreatment to working with children, adolescents, and young adults with brain tumor diagnoses. I have continued my work with patients, their caregivers and medical staff in teaching breath work through the use of meditation and gentle yoga to support them in their experience with medical trauma, the dying process, and traumatic exposure response. I’m often asked what meditation is. For me learning to meditate was learning to breathe; breathing through life’s greatest joys, pains, and the sometimes mediocrity of the day to day. Meditation has provided me with a space to be present; a moment to relinquish worries of the past or future. Sharing this gift has and continues to be a significant source of joy in my personal and professional walk. 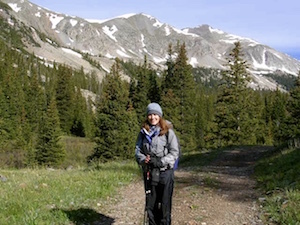 Biography: Lori is from Colorado where she grew up skiing, hiking, biking, and rafting. After teaching at a Montessori school for six years in her home state, Lori packed up for Illinois where she received her graduate degree in clinical social work from the University of Chicago. Since graduating in 2012, she has worked as a licensed clinical social worker at a Children’s Hospital in Chicago, supporting children, adolescents, and young adults with brain tumor diagnoses. When she’s not at the hospital Lori enjoys spending time with her family and friends outdoors and traveling. Lori also practices and teaches yoga and meditation. This summer Lori had an opportunity to collaborate with Chicago based non-profit, True North Treks (TNT). TNT provides young adult cancer survivors with free backpacking and canoe trips in remote wilderness regions throughout the United States. Participants have the opportunity to reconnect with themselves following their cancer treatment by being in nature, connecting with other cancer survivors and learning mindfulness meditation and yoga. Callahan, M. and Kelley, P. (1992). Final gifts: Understanding the special awareness, needs, and communications of the dying. New York, NY: Bantam Books. Newberg, A. and Waldman, M. (2010). How God changes your brain. New York, NY:Ballantine Books Trade Paperback. Singh-Dowling, K. (1998). The grace in dying: How we are transformed spiritually as we die. San Francisco, CA: Harper Collins Publishers. Van Dernoot Lipsky, L. (2009). Trauma stewardship: An everyday guide to caring for self while caring for others. San Francisco, CA: Berrett-Koehler Publishers Inc.
Lori I am a Nurse and have experienced a lot of pain taking care of my patients ,I have worked in Pediatric oncology and with the Developmentally disabled. I lost my son to cancer 3 years ago and tried so hard to continue working .but just could not .I developed severe anxiety and depression . I discontinue antidepressant medication and have started meditation again .I would really like to start a retreat for health care givers on meditation . Could you help ? Thank you for sharing aspects of your story with me. I am truly sorry for the loss of your son. It sounds like you are doing incredible work as a helping professional. Thank you. I would love to hear more about your ideas on a retreat for health care providers on meditation and help in any way that I am able. You may also enjoy connecting with True North Treks. They offer caregiver treks, as well as survivor treks. Please feel free to email me any time with your thoughts and ideas. Sending you and yours peace during the holiday season.